Thousands of passengers journeying between Newcastle, Sunderland and Durham after a late shift at work, social occasion or all-night studying session are benefiting from comfortable, convenient weekend travel with added peace of mind thanks to Go North East’s annual £10m investment in new vehicles including on its N21 and N56 night bus services. Both services are fitted internally with CCTV and bright LED lights as standard for extra reassurance to customers, and offer contactless payment options onboard to take the hassle out of the trip home. 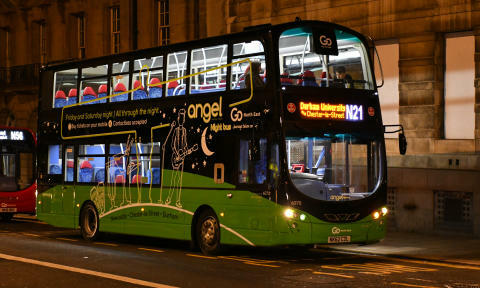 Proving popular with local students after the extension of the service to Durham University and new stops in Durham at New Elvet and Leazes Bowl near the popular Gala area, the N21 service runs in the early hours of Saturday and Sunday mornings between Newcastle and Durham University. For passengers travelling between Newcastle City Centre, Washington Galleries and Sunderland, the N56 operates early into Sunday mornings calling at Gateshead, Wrekenton, Hylton Castle and Southwick on the way. Night bus tickets can be bought on the bus or in advance through the Go North East app.